it “advocates(s) using State Bank Buddy mobile." The Matter came to light when a Twitter user took to SBI's official Twitter handle about being unable to transfer cash to their Paytms. Some users claimed that this move by SBI is anti-competitive. Few users when approached, told us that SBI's "State Bank Buddy" app didn't have a good interface like Paytm. They also said that SBI must improve it's app before banning the use of Paytm. 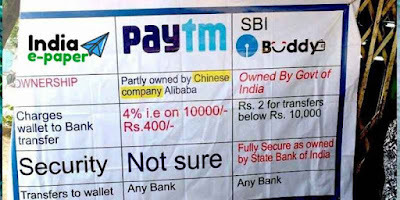 It's not the first time that SBI has skilled its weapons on the new upstart in the payments area – Paytm founder Vijay Shekhar Sharma had earlier shared a photograph supposedly outside an SBI branch, in which a banner had in comparison State Bank Buddy's feature to Paytm. 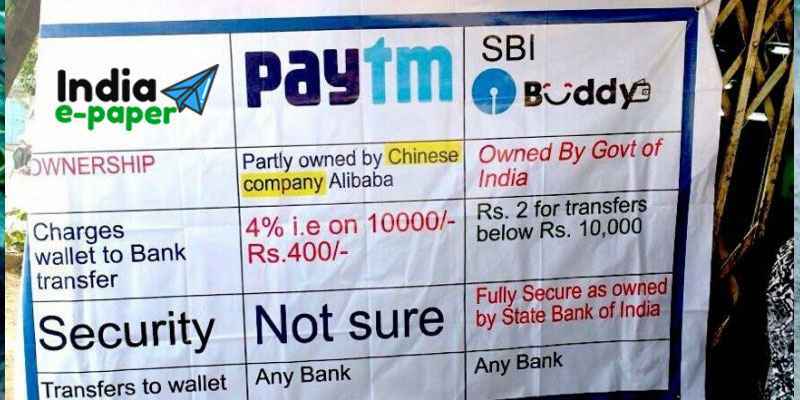 The banner, which looks like a mere WhatsApp forward, Highlighted Paytm’s ownership to the Chinese and raised questions about its safety.